HomeBlogSEOYou won’t believe these 5 helpful hints for creating (non-clickbait) clickable headlines! I was listening to Mike Peska’s The Gist podcast back on the 4th of August when it was confirmed that Facebook had begun to limit the visibility of ‘clickbait’. Obviously there are implications for journalism as a whole (a discussion of which was continued at Slate, here), which has drifted toward the Buzzfeed headline model due in no small part to the fact that the model is, historically, tremendously successful. However, Facebook has been battling clickbait for years now and, as its users become increasingly dissatisfied with timelines full of clickbait articles, the effort to suppress their visibility is being taken to the next level – with Facebook’s new filter targeting headlines which are purposefully misleading or which withhold information. It is certainly not beyond the realms of possibility, as Google continues to fight spam in SERPs and Twitter struggles to achieve profitability, that this kind of filtration could become standard across platforms. Could this fall foul of Facebook’s new filter? In reality, however, clickbait is often only an exaggeration of traditional journalistic headline writing (some, like the ‘you’ll never believe’ example above are, of course, awful – but outliers). What Facebook is really campaigning against is a proliferation of articles which are clicked by its users who then bounce after a very short time due to misled expectations created by the headline. What is required to avoid losing traction on Facebook is not a dry and pointed headline, but the same best practices that have been taught to journalism students for decades and the same that should have always been implemented across social platforms by any brand which leverages content as part of its business model. I think the above, though certainly couched in negative terms, would be a reasonable description of a headline – insofar, at the very least, as its purpose is to attract attention and draw visitors to a particular page. It’s not even, not really, the sensational or provocative nature of headlines which is really responsible for the weariness people have developed – it is, as Facebook states, the misleading nature of the headlines, or headlines which needlessly withhold information. With this in mind, here are five guidelines for the writing of clickable headlines that will not just be clickbait. Identify your key terms: Whether you’ve written the article or blogpost yourself or are acting as a sub-editor, it’s vital the piece’s content is accurately and interestingly conveyed by its headline. 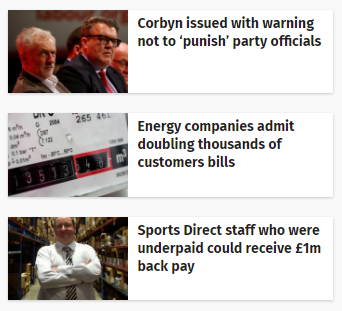 For example, today’s headline story on The Guardian’s website has a lead line which reads ‘Deal struck with Unite and HMRC affects thousands of workers and follows Guardian investigation into pay rates at retailer’, while the headline reads ‘Sports Direct – Warehouse staff to receive back pay totalling £1m’.Here you can see that the headline is concise and informative, summing up the financial award and the outcome of negotiations. Were a reader to want to, they could gain the necessary information from the headline alone – yet the headline still promises enough information for those interested in current affairs to click through. Use the active voice: It is easy to slip into passive voice when writing longer pieces, but headlines should always retain an active voice. The active voice lends itself to many of the attributes a good headline should possess – present tense (where appropriate), clarity and brevity.Take the following (from The Independent), which maintain the active voice, in all three cases allowing the subject of the article to appear at the beginning of the headline. Be correct and connect: Headlines should always be correct – not only in what they state, but also in any implication the headline makes and it must be easy to understand. You want your audience to be able to parse the meaning of a headline at a glance. This means conveying your information simply and quickly – more people will always read your headline than will read the text beneath it, but you need to ensure that your headlines are reducing the disparity between the two by making sure you make an impact quickly. I addition to increasing click through, a good, factual and clear headline can build trust between your brand and your consumer. Take the TACT test: Each iteration of the headline should be subject to this quality assurance stage. 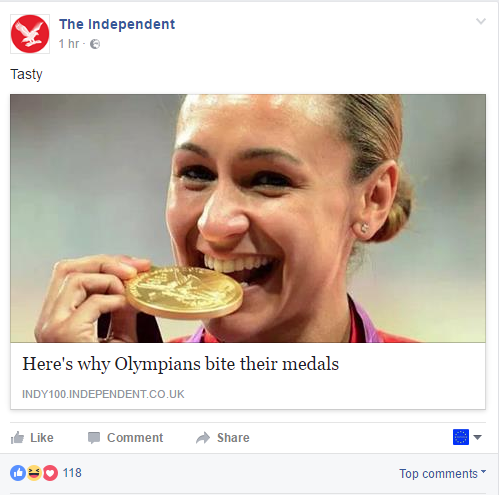 It’s a long standing journalistic tradition, but it applies to all forms of headline – potentially more so for social media where character limits can potentially lead to embarrassment.Taste – is it in good taste? Could it be perceived to be offensive? Attractive – does it capture attention? Could it be improved without sacrificing accuracy? Clarity – is it clear, could any words have double or unintended meanings (nouns as verbs, or double-entendres). Truth – is the content true or as true as is possible based on current knowledge? Not only is this important to avoid legal action, perceived untruths can also adversely affect the trust consumers have in your brand. Make it worth their while: Though not about the headline per se, it is vital that all of the work put in to the creation of a clickable headline is not let down by the content attached. It takes very few negative experiences for a consumer to dismiss your brand’s work as unworthy of their time, so that in future it will not matter how good your headline is. For more information on all areas of search marketing, check out our extensive list of resources or blogs, or to see what Click Consult can do for your brand, contact us today.